Tenga’s special edition Keith Haring designer masturbation egg features his sublime artistic work perfectly fashioned into the Tenga Egg form. The Dance Egg – like all dance, this egg is rhythmic, sensual and entirely unpredictable. The strong lines formed from this piece of artwork on the egg surface is intended to provide a flourish of sensations, leading to a wild climatic finish. Tenga’s special edition Keith Haring designer masturbation egg features his sublime artistic work perfectly fashioned into the Tenga Egg form. Dance Egg – like all dance, this egg is rhythmic, sensual and entirely unpredictable. The strong lines formed from this piece of artwork on the egg surface is intended to provide a flourish of sensations, leading to a wild climatic finish. 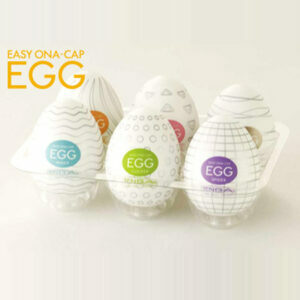 Produced from high grade body safe silicone, free from phthalates these eggs, as with all other Tenga products, and completely safe to use, and specifically designed for male masturbation. In addition the attractive artistic packaging makes the Keith Haring range perfect for a gift. Born in 1958 in Pennsylvania, Keith Haring became renowned later in life for his public artworks in cities throughout the world. Much of his work was created during the 1980’s. As his work became more prominent Haring was sort after by such diverse artists as Madonna, Grace Jones and Andy Warhol (to mention a few). Diagnosed with HIV/AIDS in 1988, he tragically dies at the age of 31 on 16th February 1990 from Aids related complications. But during his last years Haring used his work to generate awareness and activism worldwide about HIV/AIDS. It is from this action that Tenga celebrates his life and supports his endeavors with the Keith Haring line.